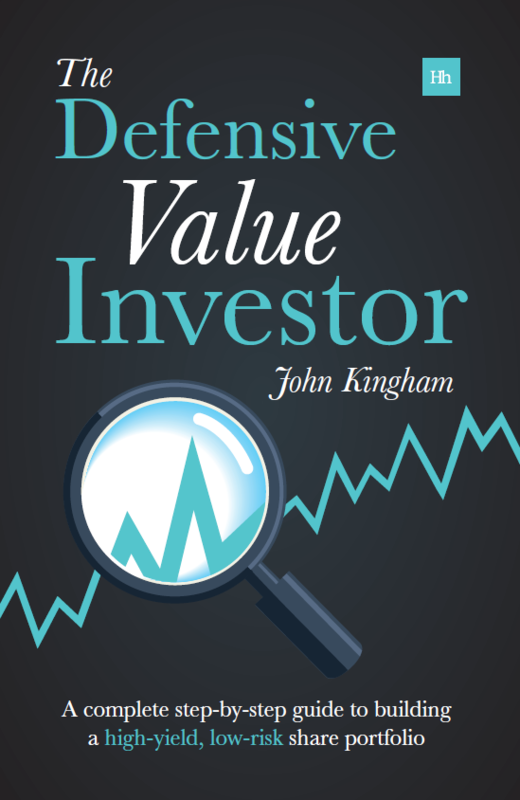 As a value investor you’re looking to buy companies that are priced attractively, but you’re not the only player in town. There are other investors and companies out there that also have capital to deploy and if something looks attractive to you it may well look attractive to them too. That’s exactly what happened with Robert Wiseman Dairies, a company which joined the UKVI model portfolio back in May 2011 for 317p per share. It seems that I wasn’t the only one out there who thought this major milk company might be worth more than that. Muller Group (yes, the ones that make the yoghurt) have recently agreed to take over RWD at 390p per share. 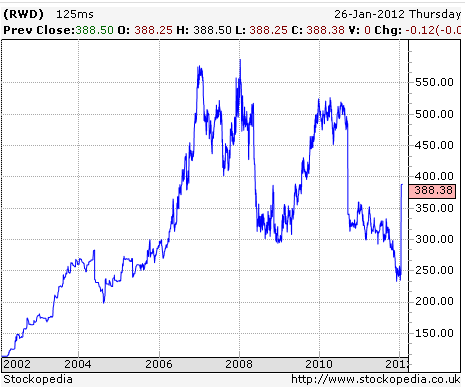 I bought the shares at 317p in mid-2011, just in time to watch the share price drop off (another) cliff down to 250p. Anyone who invests with a stop-loss would have likely been kicked out and then kicked themselves as they missed the Muller-bounce to 390p. Let’s go back and see exactly why this industry leader was so attractive to both me and Muller. I always use checklists when making investment decisions because it brings consistency, repeatability and discipline to an incredibly important task. Do they bring diversity to my existing portfolio? Yes, I didn’t own anything like a milk dairy and distribution company at the time. Not really. At the time the minimum size for companies being added to the model portfolio was £100 million, whereas now the rule is that they are listed on the FTSE 350 which usually means they’re at least worth hundreds of millions. But Robert Wiseman was not a tiddler with a value of almost £300m. Yes. It is the leading milk distributor or they’re one of the big three, depending on who you ask. Yes. It has made a profit in every one of the last 10 years and have always paid a dividend in that time. The trend in earnings over the long term is upwards. Yes. At the time the interest payments were covered 38 times over and debt was only about 1/3rd of operating profits which is next to nothing. Does it have a consistent operating history? Yes. It is in the milk production and distribution business and has been for a long time. Is it facing a problem today that might damage its earnings power permanently? It is currently being squeezed as part of a milk price war between the supermarkets. However, people will always want fresh milk so somebody has to make it. RWD have the lowest production costs and so could have potentially remained the ‘last man standing’ in the industry as other competitors gave up on milk first. Is there a risk of its economic engine becoming obsolete? Not really. I think people in Britain will want fresh milk for a long time yet. Is it cheap relative to the long term earnings average? Yes. At 317p it was priced at only 11 times the 10 year average earnings. If you’ve been reading my articles for any length of time you’ll know that the 10 year earnings average can be used as a ‘baseline’ figure of earnings power for relatively stable companies. Does it have a sustainable high yield dividend? Yes. The dividend has a solid history and was well covered by earnings and free cash. The yield at the purchase price was around 5.7% which is a couple of percent clear of the market. Is it growing rather than shrinking into oblivion? Yes. The long term earnings growth rate is something around 8% or so. You can see from the table above that revenue, earnings and dividends are all up over 100% in the last decade. Of course that’s past growth, but what would you rather have, a company with a history of decline? So to summarise, it was a relatively large, stable and market leading company that had a short term problem in the shape of the supermarket milk war. Muller probably saw the long term earnings power of RWD’s world class assets (most efficient milk production in the world, super-efficient distribution network etc.) and its future potential rather than the short term problems. Of course I didn’t know that Muller were going to take over RWD when I picked the shares up during May. However, by buying a leading company with a long-term future and a proven ability to generate profits, and more importantly by buying the shares when they were cheap, I massively increased the odds that any takeover would generate a profit rather than a loss. The total returns over about 9 months were close to 25%. How does that break down in terms of the drivers of equity returns (dividends, changes to earnings, changes to valuations)? This is a fairly typical pattern for short term returns. It’s a long-proven fact that the majority of returns (both positive and negative) in the short term come from changes to valuations. 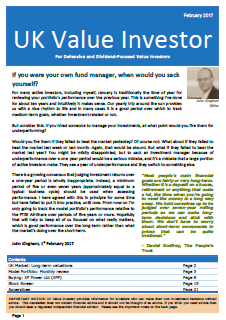 As a long term investor, if you want to maximise the opportunities available to you then you have to focus on all three drivers of equity returns. Nice article. I liked the fact that you only had a few items on your checklist. Often, when analysing companies I have a multitude of items on my checklist which always ends up with me not investing at all. So beyond perhaps 5 or 10 key factors, all the additional factors probably don’t add anything to the job of analysing an investment. It may be that outside of the really big factors (debt, profitability, market leadership, etc), a deeper analysis of all the little factors just creates the ILLUSION of knowledge. But I understand that that’s a somewhat unusual position to take. Typically investors love to dig into the minutiae of what’s going on today or this quarter. If they can gain an advantage from it then fair play to them, but I know that in my case I probably can’t so I’m better off looking at the long term. Typo alert: The share prices in the first part of the post are of course supposed to be 317p (not 3.17p) and 390p (not 3.90p). I was about to alert you to the typos. Can you not edit them yourself with your software? (Just curious as I assume all WordPress blogs are easily edited). Wasn’t sure if it would re-fire off an RSS thingy so I just made the comment. I’ve fixed the typo now so if the RSS goes out again and drives any readers insane it’s your fault! I do love following your plays, John. I haven’t currently ‘proven’ myself with this stuff and so only a small proportion of my portfolio is allocated to this kind of company in this type of situation. I don’t get to play in this area as much as I’d like so it’s great to check in on your progress. I liked your stop-loss comment. You certainly do need the patience and mettle when it comes to this stuff. Hi Ash. Yes, any time you go near equities you have to be able to stomach the paper losses. That’s the main reason I favour broad diversification because any losses to one company out of say 30 or 50 are less likely to keep you up at night. And starting off with a small portion of your total fund is the way to go. I have always had a tendency to jump right in with all guns blazing which has cost me a couple of times in the past. We all make mistakes and anybody who says that don’t is a liar!